1. Elemis Tri-Enzyme Resurfacing Facial Wash - It's the resurfacing part that got me with this one -I love a product that promises texture-less skin. And I love one that delivers even more. This has quickly become my regular morning staple for washing my face, as it gives me an amazing thorough cleanse without drying my skin. It has done wonders for helping me to balance out my combination skin - and any cleanser that helps keep my blemishes at bay is a friend for life. 2. Koh Gen Do Cleansing Spa Water - Attention, attention - holy grail contender. HOLY. GRAIL. CONTENDER. Sorry to shout but I wanted to make sure you got the message - which is - you cannot live without this product. EVER. I picked it up on a whim in Sephora (after hearing people blab on and on about it.....so pushy those bloggers), and fell in love instantly. It is a gentle, soothing makeup remover/cleansing water that is supreme at removing makeup all the while making your skin feel soothed, hydrated and nourished. Even when using another cleanser (I have an addiction, I get it), I still use this after to remove any stubborn remnants and to make my skin feel wonderful. And to keep the party going, this cult classic also comes in makeup wipes. Cleansing spa water for everyone! 3. Tatcha Deep Rice Enzyme Powder - Yes I just did a review of this. Yes I know I Instagram it all the time. Yes you are just going to have to read about it again - I simply cannot contain my love for this product. I want to shout it from the rooftops so putting it in a beauty favorites is the LEAST I can do. An exfoliator to rival all exfoliators, a 2-in-1 cleanser in a pinch, the gateway to perfect skin - yup, it's all of these things. Read my full review here. And then purchase here. Finally, when your skin is amazing, as a thank you, send me here. 4. Arcona Raspberry Resurfacing Peel - It's a wonder I even have any layers of skin left with all the resurfacing products I throw at it, but more is more right? That being said this product is not for the faint of heart as it tingles quite a bit (that's how I know it's working, I tell myself), however the results are 100% worth it. What is left behind after this 1-2x/week treatment is simply marvelous - glowing, soft and smooth skin. I use this regularly to help give my skin a deep exfoliation/resurfacing, but the magic is that my skin is still left feeling so hydrated, soothed and BRIGHT! 5. Koh Gen Do Aqua Foundation - It absolutely pains me to just have found this foundation now. So many years spent searching for the absolute perfect foundation that will never fail, will always look flawless and does everything I need without even asking - and here it was all along. I will be doing a full review on this shortly so I don't want to give away too much, other than it's perfect, and I love it, and it makes my skin look like no other....I've already said too much. Typical. 6. Lush Popcorn Lip Scrub - It's a lip scrub that tastes like butter popcorn. Seriously. And it's awesome. 7. Essie Butler Please - Again, here is a product that I have seen everyone rave about, and yet I, stubbornly take so long to partake in all the fun. I hope this stunning blue nail polish taught me my lesson - listen to everyone else, follow the crowds, be a beauty lemming, jump off the Brooklyn brid......ok, ok, I know where to draw the line. 8. MAC Absolute Power - As winter is hard at work trying to destroy my face, I am fighting back with bold lips to help distract away from any cold weather skin fails. And this lip is top of my list - a deep raspberry/wine that is easily worn day or night. See how cute I look? 9. 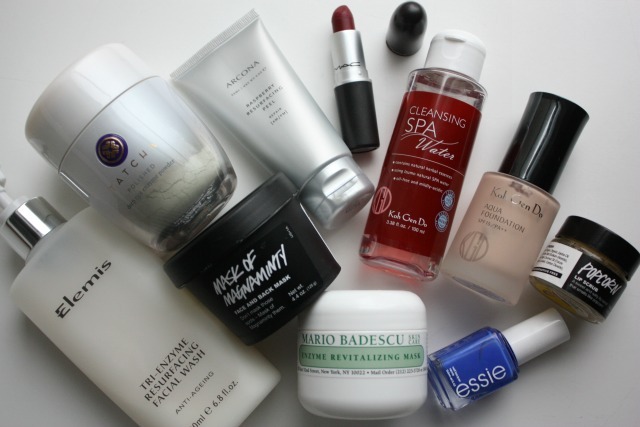 Mario Badescu Enzyme Revitalizing Mask - Oh, another MB product is in my favorites? Cue shock and awe. And then cue really great skin. Though I don't have dry skin, I find this mask gives me a surge of hydration (oily skinned gals need water too), while the papaya and grapefruit extracts help to remove any dead/dull skin (I picture it like little pac-men chomping away on my skin - I'm so weird), leaving me....er rather my skin glowing and refreshed. 10. Lush Cosmetics Mask of Magnaminty - Could I have any more masks in my arsenal? No I could not. (yes I could and will - don't you try and stop me) My stubborn clogged pores and acne prone skin is no match to this deep cleansing treatment. And it's minty. And tingly. It's mingly.